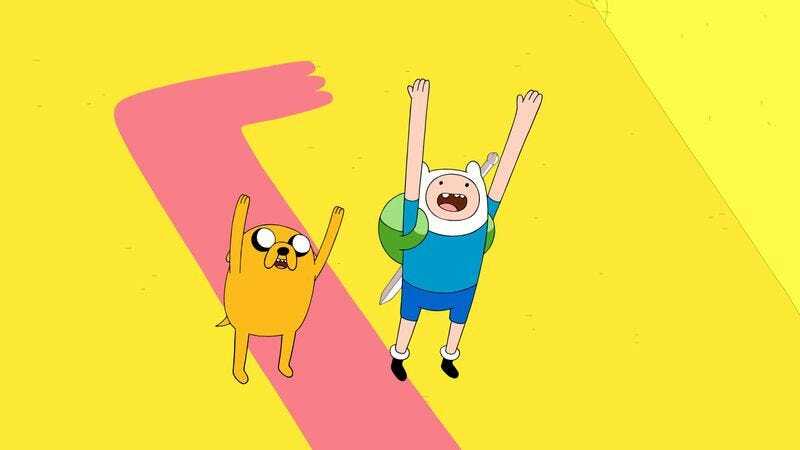 No, Adventure Time isn’t crossing over with Steven Universe or Regular Show or Uncle Grandpa in this week’s “Crossover,” so just abandon that hope right now. As much as I’d enjoy seeing an inter-series crossover on this show—imagine Steven and the Crystal Gems dropping into Ooo for an episode—tonight’s episode is more insular than that, sending Finn and Jake through dimensions to stop Ice Finn and Lich Jake from shattering the structure of the multiverse. It’s a thrilling episode with some very impressive visuals, but also ends with a significant, unexpected emotional gut punch that takes advantage of the undercurrent of tragedy that runs through this post-post-apocalyptic series. Writers and storyboard artists Jesse Moynihan and Sam Alden begin the episode by dropping the audience right into the action, opening on Finn and Jake walking through dense snowfall to the giant mountain created by Ice Finn. There’s no explanation for their mission at first, we just know that they’re up against Ice Finn, who is as maniacal as he was back in “Jake The Dog.” The terror of Ice Finn is accentuated by the tableau of pained silhouettes contained in the ice blocks that form the mountain, haunting shadows that also call back to this show’s history of nuclear devastation. This opening sets a bleak tone for the episode while kicking off the story with a lot of momentum, and establishing the high stakes right at the top heightens the comedy when the episode flashes back to one hour earlier to show Jake, Finn, and BMO gleefully swinging from the ceiling in their tree house. Moynihan and Alden consistently diffuse the increasing tension with humor, and that balance of light and dark elements makes for a captivating episode. The treehouse will be used for comedy later in the episode during an especially dire moment in the main action, and after Finn cuts off Lich Jake’s hand with his plant arm, the hand drops into the multiversal pool, travels through dimensions, and lands on BMO, who is still where Finn and Jake left him an hour ago. It’s a welcome visual gag that adds some tonal contrast to the plot, but it also shows the consequences of tampering with the multiverse, establishing that anything that falls into the pool has ramifications on every dimension. The image of Jake’s adorable dog body with a horrifying Lich head is deeply disturbing, and it’s even more unsettling when paired with Ron Perlman’s cavernous vocals for the Lich. Moynihan and Alden have a deep understanding of Perlman’s strength as a performer that can play severe and menacing, and they give him some extremely grim lines. “Everywhere you will die,” Lich Jake tells Ice Finn when they unlock the multiverse with the Enchiridion. “You, your family, everyone will die. Over and over. Mountains of broken bodies, beneath the wheel.” It’s very creepy, and reaffirms that Perlman is the perfect actor to play the physical embodiment of death and destruction. Another fantastic casting choice is Kumail Nanjiani as Prismo. There’s a smoothness to Nanjiani’s voice that is a great fit for a character that is both totally flat (physically smooth) and very charming (personally smooth), but there’s also an aloofness that is appropriate for a godlike being who exists on an elevated plane of reality. Those qualities come in handy when Prismo delivers lengthy exposition explaining the backstory of Ice Finn and Lich Jake for any viewers that missed their appearances in season 5, and the personality in Nanjiani’s performance helps keep the viewer engaged through the recap. “Crossover” is a striking episode, with bold color choices and dramatic compositions that intensify the impact of the story. The grandeur of the plot is established right at the beginning of the episode with an imposing shot of Ice Finn’s mountain. Foreboding green clouds circle the structure, and this combination of freezing blue and toxic green is the palette for most of the fight. Certain visual elements are given extra significance by popping against this dominant color combination—Ice Finn’s yellow crown, Jake’s orange body, the pink Maid—and when the Maid is finally activated, an aggressive beam of neon pink obliterates the noxious green cloud, replacing them with a salmon sky that has a much more comforting dynamic with the bright blue of the frozen setting. That comfort is essential for that big emotional gut punch I mentioned earlier, and once Finn and Jake heal their alternate dimension counterparts, Finn gets a glimpse at what his life would be like with a loving human family. It’s a moment that takes just a few seconds, but Jeremy Shada’s reading of the line, “Huh, that’s his family,” is so full of pensive longing that those seconds end up having immense resonance. That makes it the perfect time for some humor, and instead of ending on a melancholy note, Moynihan and Alden conclude by detailing Jake’s very different reaction to his alternate dimension self. “Hey look how dumb I am in that world,” Jake says. “‘Woof woof woof! I eat stuff off the ground.’ I don’t know, what are dogs even into these days?” There’s tragedy in Finn seeing the human family he never had, but ultimately it’s not enough to overshadow the joy and humor at the root of this series. Who is Prismo’s boss? I have a feeling we’ll find out. Some very fun Jake transformations in this episode: He slithers across the ground with Finn inside him, then shapeshifts into a flight of stairs for Finn to use to get up to the Enchiridion. To distract Ice Finn, he tries to correctly write the word “MAGIC” with his body, and then turns into a weird living alien portal thing. I’m going to assume that the most detailed people trapped in ice are probably the cast and crew of Adventure Time. If anyone can confirm this, I’d appreciate it! “You’re lucky I don’t take the other one, kid. Quit crying, baby!” Hyperviolent BMO is so cute. For BMO’s next genre pastiche, he should make a Die Hard style action thriller.